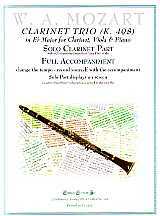 Mozart’s Trio, K. 498 (for clarinet, viola & piano) was completed in Vienna on August 5, 1786. It was written for one of his pupils, Franziska von Jacquin (piano) with Mozart himself as violist and his friend Anton Stadler (1753-1812) on clarinet. It is nicknamed Klegelstatt Trio (klegelstatt is the Austrian term for “bowling alley”) because the legend is that Mozart composed the entire work on a single day while bowling with friends.